Bath resurfacing by our resurfacing professionals will transform your bath, at an unbelievably low cost and you get a highly durable surface, a great choice of colours and quality professional finishes. If you are thinking of a full renovation be prepared to pay for a new bath and fittings, a new bathroom floor, new tiles, new bathroom vanity, basin, taps etc OR Choose the smart solution – bath and bathroom resurfacing. 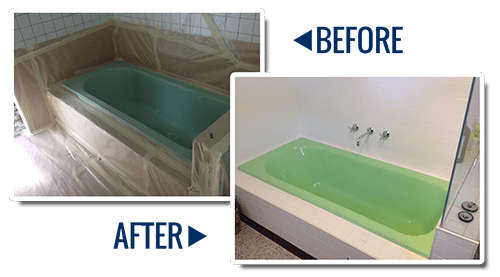 Bath resurfacing is an affordable, hassle-free solution for old, worn-out bathtubs. If you live anywhere in or around Adelaide and have decided that you bath has finally come to the end of it’s life and is looking more than a little bit tired, then you will be hunting around for a replacement. Once you start looking at the prices of new baths, you start to realise why you haven’t bought a new one already! Don’t forget you also have to add the cost of plumbing and re-tiling too. Getting an old bath out without breaking tiles is almost impossible. Depending on the age of your floor and wall tiles you may not be able to find anything to match them, which is really going to hike up the cost. If you want to keep the cost of rejuvenating your old bath down and don’t want to be looking for new tiles than resurfacing your bath is the answer! Resurfacing Solutions SA have years of experience renovating baths, bath tubs and all other bathroom surfaces. Whether you have a free-standing bath or fitted bath we can resurface it. It doesn’t matter what colour it is to start with, you can have any colour finish you want. Obviously today’s most popular hue is white and our experienced craftsmen will finish you bath in a sparkling smooth finish that will last you for many years to come. We undertake bath repair and bath restoration beyond the resurfacing. We can resurface or replace your tiles and repair or replace all your bath fittings. The resurfacing is highly durable and gives an unmatched new surface to the bath. The bath will be freshened up and reinvigorated, even the most worn bathtubs. Repairing bad chips may mean some additional treatment but most small scratches will disappear. You will be delighted by this long term solution and the glossy, brand-new look result. Your bathroom will look better than ever. Bathtub resurfacing costs start at $557.00 – the most affordable bathroom renovation solution available. If your bathtub has only got one or two small chips, a complete resurface is not usually required. We can spot repair the damaged areas. Light stains and scratches can also be removed by polishing the surface (where possible). The quick chip repair service will restore your bath tub effectively. We will restore you worn and faded bath or bathtubs, including classic cast iron and claw foot baths without any need for the bath to be excavated or removed. We have undertaken bath resurfacing on 100s of baths replacing out of date colours with modern high gloss finishes. Bath resurfacing is often overlooked but basically it will restore your bath to brand new condition. Now consider your bathroom. Bathroom renovations can be very expensive. We have your budget in mind. Resurface your bath, vanity cabinets and surfaces, bathtubs old and new (even classic cast iron bathtubs), bathroom tiles can all get the resurfacing magic. Guaranteed brilliant long lasting results. Old and tired baths or bathrooms with out of date colours and designs can be given a refresh that will be hard to believe. Resurfacing can be undertaken on nearly all kitchen surfaces. Laminex, tiled kitchen benchtops and any similar surface will resurface without dismantling or taking away anything. Most chips, burns, stains and cracks will disappear. Kitchen repairs are undertaken on-site, you will not be able to use your kitchen (time for take-away) for a short time (usually a day will be enough). Kitchen Cabinet Doors – Full refacing, this is not just a paint job. Kitchen Wall Tiles – We fix aged faded tiles, restore gloss, re-grout. Hide cracks. The savings are amazing. Just a fraction of a kitchen renovation. You save because this long lasting solution is quick – in many cases you will be back in your kitchen within 24 hours. Completely transform your kitchen with a fresh modern look and a high quality professional finish in your choice of designer colours. Adelaide’s best solution to rejuvenate tired old bathrooms and have them looking as good as new. Take a look at some of our exceptional resurfacing results and trust us to bring some life back to your bathroom. Kitchen restorations done quickly and inexpensively by a firm with real experience. 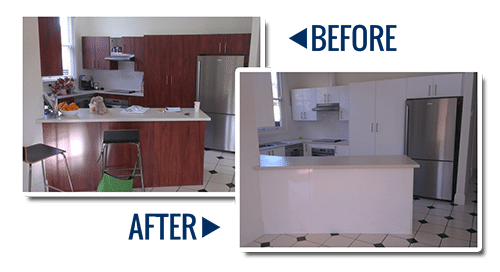 With a quick, effective resurfacing process for bench tops and cabinets, we can eliminate the fuss and have your kitchen looking as good as new. Resurfacing Solutions SA offer no obligation free quotes for all of our services. Whether it’s a bathroom, kitchen or wall tile resurfacing you need, call us or send an email for a quick and simple quote.